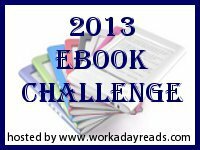 Via the Norwegian blog Anitas blogg I found my way to Workaday reads and her Ebook challenge for 2013. This sounds like the perfect challenge for me and my beloved Kindle! Workaday reads have decided some levels you can choose from and I commit to read 25 Ebooks in the next year. And although I found it difficult to set my level, it’s supposed to be a challenge! Ja, det må absolutt være billigere!